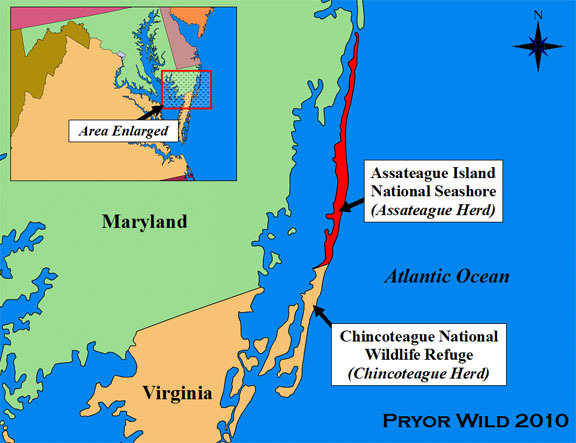 As has been shown throughout my series of posts on PZP, there has been a lot of research done with PZP and the wild horses of Assateague Island. Today I am going to discuss the history of PZP and Assateague Island. 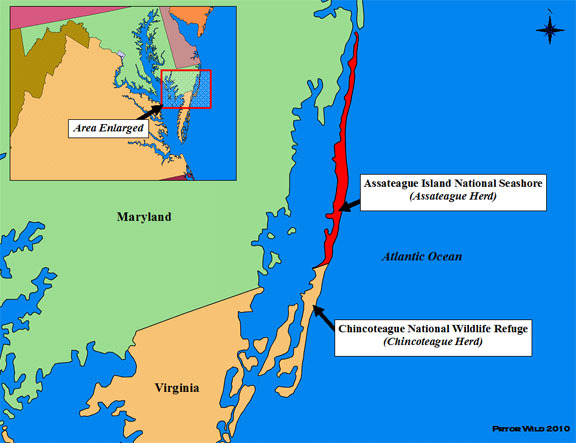 It is first important to understand where Assateague Island is, and what I mean when I say “wild horses of Assateague Island.” Assateague Island is a barrier island off of Maryland and Virginia. As we’ve gone over in previous posts, PZP is a vaccine. It influences immune responses that lead to the disruption of fertilization. PZP must be administered periodically as its ability to influence immune responses is reduced over time. Depending on the method of delivery, treatments must be given every one to two years at a minimum. But let’s think about the other side of all this: How many PZP treatments can a mare receive before her immune system has been so bolstered that she is unlikely to get pregnant again? That is, are PZP’s effects reversible? This will be the topic of today’s discussion. In past posts, I have discussed ways in which PZP could possibly affect the health of mares. These posts largely focused on possible negative side-effects. There has also been research done to show that mares treated with PZP may receive indirect positive benefits. This will be today’s topic. A study (Turner and Kirkpatrick 2002) has been published regarding the health of treated and untreated mares on Assateague Island. In the study, comparisons were made between body conditions of mares in 1989 and in 1999. PZP started to be used on Assateague Island in 1994, and so 1989 and 1999 were good years for comparing the herd prior to and after treatments. Body conditions were assessed with a standard system with scores ranging from 1 to 5, with 1 describing the poorest body conditions and 5 describing the best body conditions. The average body condition score for mares in 1989 was 2.33 (plus or minus .35) while the average body conditions for all mares in 1999 was 2.96 (plus or minus .08). In looking at mares not producing milk, the average body condition score in 1989 was 2.42 (plus or minus .38) and in 1999 was 3.07 (plus or minus .05). Thus, it was determined that the body conditions of mares in 1999 were significantly higher than those in 1989 when looking at all mares and mares who weren’t producing milk. This isn’t the case with mares who were producing milk. The average body condition score for these mares was 1.96 (plus or minus .6) in 1989 and 2.0 (plus or minus .55) in 1999. All together, this makes sense: If mares aren’t having foals, they will have higher body conditions as they aren’t having to expend extra energy carrying a foal and then supporting it as it matures. Thus, when PZP was used to prevent mares from having foals, the body conditions of treated mares significantly improved.